The roan antelope (Hippotragus equinus) is a savanna antelope found in West, Central, East and Southern Africa. It is the namesake of the Chevaline project, whose name was taken from the French Antelope Chevaline. 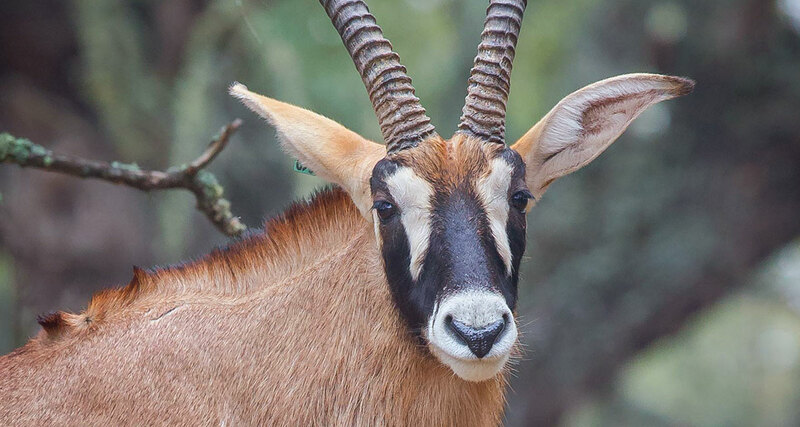 Roan antelope are one of the largest species of antelope. They measure 190–240 cm (75–94 in) from the head to the base of tail and the tail measures 37–48 cm (15–19 in). The body mass of males is 242–300 kg (534–661 lb) and of females is 223–280 kg (492–617 lb). The shoulder of this species is typically around 130–140 cm (51–55 in). Named for their roan colour (a reddish brown), they have lighter underbellies, white eyebrows and cheeks and black faces, lighter in females. They have short, erect manes, very light beards and prominent red nostrils. The horns are ringed and can reach a metre long in males, slightly shorter in females. They arch backwards slightly. They are similar in appearance to sable antelope and can be confused where their ranges overlap. Sable antelope males are darker, being black rather than dark brown. Roan antelope are found in woodland and grassland savanna, mainly in the tropical and subtropical grasslands, savannas, and shrublands biome, which range in tree density from forest with a grassy understorey (such as central Zambezian Miombo woodlands) to grasslands dotted with few trees, where they eat midlength grasses. They form harem groups of five to 15 animals with a dominant male. Roan antelope commonly fight among themselves for dominance of their herd, brandishing their horns while both animals are on their knees.